An enchanting archipelago, the green beauty of the islands is interspersed with tranquil lakes and volcanic landscapes. Scattered with flowers, the Azores islands gleam with the purity of nature, intact as if no one had ever lived there. In the heart of the Atlantic Ocean, over 1000 miles from mainland Europe, sits an archipelago that would give Hawaii a run for its money. Like their American counterparts, the Azores are the volcanic tips of some of the tallest mountains in the world - measured from the sea floor, that is. They lie across the Terceira Rift, a triple junction between the Eurasian, African and North American tectonic plates, making them some of the most volcanically active and compact islands in the world. Often compared to the American archipelago of Hawaii for its volcanic landscapes and abundant rainforest, the Azores are a haven for active holidaymakers. Despite its myriad of attractions for visitors, the Azores remain well away from the trappings of mass tourism and, where their American sisters already receive millions of tourists every year, along with steep price tags on both flights and accommodation, you'll find more competitive figures and better value for money on Sao Miguel. Discovered in 1427, settlement began here in 1444 and, with extremely fertile volcanic pastures, communities have thrived ever since. Boasting a wine heritage dating back over 500 years, and a status as the only spot in Europe capable of naturally cultivating tea, tobacco and pineapple, the Azores are a natural treasure chest. More than that, its beauty, diverse landscapes and awesome marine life makes this archipelago one of the most desirable holiday destinations in the world. The biggest of the archipelago's islands is Sao Miguel. Known as the Green Island by locals, its volcanic pastures make for extremely arable farming land, but its more exotic flora and fauna are the real attraction. The Terra Nostra Park, alongside the village of Furnas, has become a very popular spa and summer resort. Its geothermal swimming pool , balmy all year round at a consistent 25°C, attracts many of the area's visitors, but there are also excellent hiking opportunities exploring along the Amarela stream and Serpentine lake. Here, carving a jungle pathway, is one of the best places to appreciate the tropical natural environment of the island. It's not a bad idea to pack a raincoat and an umbrella even in the summertime. If there's a rain shower enjoy the rainbows that brighten up the sky and seem to link the islands like a bridge. Also, organise your inter-island transport links in advance. If island hopping isn't for you, stick to the largest, most populous, and probably most breathtaking: Sao Miguel. 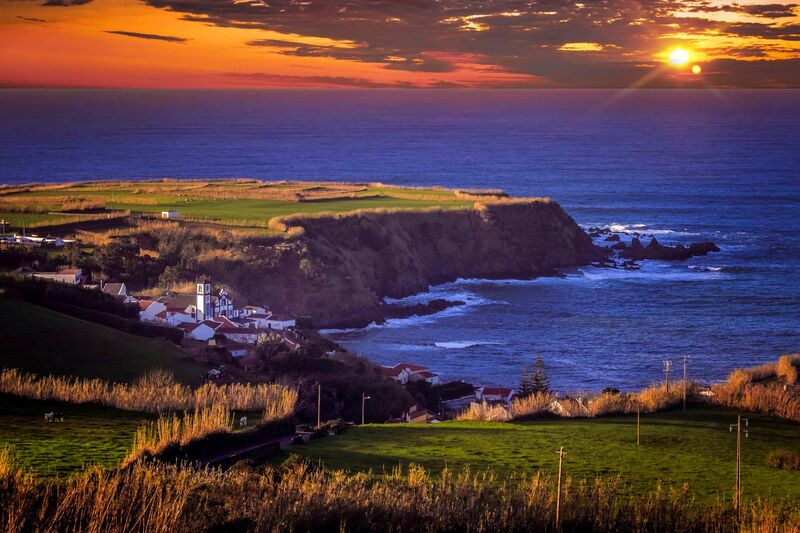 With 140,000 friendly inhabitants, Sao Miguel houses a level of luxury unmatched across the Azores. 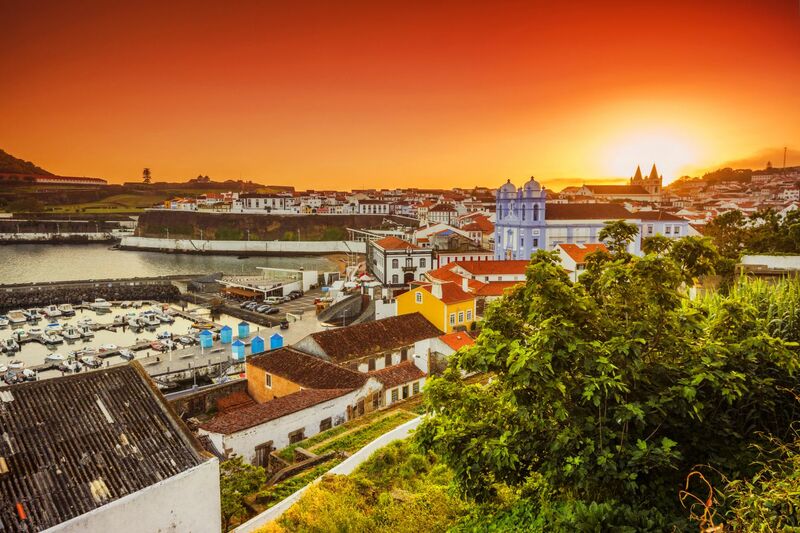 Its capital, Ponta Delgada, came to early prominence through the export of tea and tobacco. Today, though, it boasts a modern marina equipped with ocean-front gourmet restaurants and cafes, shopping centres and, for the party-minded, plenty of bars and night-clubs. To get the best of Sao Miguel, you have to stick your head far above the jungle parapet and head to one of the many spectacular vantage points. One of the most impressive is probably Boca do Inferno where, from on high, it's easy to appreciate the sheer beauty and scale of vast volcanoes, jutting into the sky before swooping down into endless lagoons that seem to emit a quasi-flourescent turquoise blue, from Sete Cidades in the west to Furnas in the east. The activities that attract most of this island's visitors, however, do not belong to Sao Miguel itself but rather in the ocean that surrounds it. It is widely agreed that the Azores is one of the best whale-watching spots in the world. Hop on a boat trip courtesy of seabookings and you won't be disappointed. If you're not content with just spectating, Sao Miguel is also a fantastic place to swim with the world's most majestic marine mammals. Further beneath the ocean's surface is a goldmine for amateur divers who want to get up close and personal with the volcanic ocean bed and all the weird and wonderful marine life that entails. -No great architectural monuments due to potential damage by local active volcanoes. The worship of the Holy Spirit, very strong on the island of Terceira, is ubiquitously celebrated across the entire archipelago on the fifth Sunday after Easter. The local population chooses one person nominated to be "the merciful emperor", who provides food to the poor and places them under effective protection from dangers related to volcanoes. Then "tourada à corda" takes place - an intriguing show of bull's fight occurring downtown in the towns and villages. The cozido is a stew of chicken, pork or veal accompanied with cabbage and potatoes while São Jorge is world famous for its cheese, the queijo são jorge, made from goat's milk. In general, the people of the Azores eat açorda, a soup of water, salt, pork and fish. There's also a great choice of fish and seafood to go along with the local wines. The Azores islands are certainly not known to be a shopping destination but if you cannot resist a purchase or two, in general the shops are open from 9:00am to 1:00pm and from 3:00pm to 7:00pm, Monday to Friday, and remain closed on Saturday morning and Sunday.